"I say to you very solemnly this evening: This cathedral will be rebuilt by us all together," he said near the 850-year-old church as hundreds of firefighters were still working to put out the fire. "We will rebuild Notre Dame because that is what the French expect, because that is what our history deserves, because it is our destiny,"
Now, as authorities are surveying the extent of the damage done to the beloved site and renowned religious landmark, several of France's most wealthy families are pledging hundreds of millions of dollars to aid in the repair effort, and millions more are pouring in from donors around the world. Though the fire was only extinguished around 10am local time Tuesday, France 24 reports that Paris Mayor Anne Hidalgo is already planning to put together an "international donor conference" in order to coordinate all of the funds being raised to help restore the architectural wonder. It's too early to know the full extent of what was damaged or destroyed, though optimistic early reports indicate that much of the cathedral's stone construction remains intact and that many of the most valuable relics and works of art that were inside had either been rescued or spared from the flames that ravaged the church, which was declared a UNESCO heritage site in 1991. Still, the fire caused the Gothic cathedral's iconic spire and much of the roof to collapse, and the repair job is going to be an enormous (and enormously expensive) undertaking that could take decades, according to The Guardian. "It's already a wet building because of the water that's been pumped on it, so they're going to need to provide some kind of cover from the elements," said architectural historian Jonathan Foyle in an interview with CNN. "The roof's job was to discharge thousands of tons of water, so where's that going to go? Every time it rains it's going to cause damage at this point, so it's against a war of attrition now." He also warned that high heat can weaken limestone, which puts the structure at risk of localized collapses. By Tuesday afternoon, nearly $800 million had already been pledged by some of France's richest families to help fund the effort. Two hundred million Euros ($226 million) each were pledged by the Arnault and Bettencourt Meyers families, which own the LVMH group and cosmetics company L'Oréal, respectively. Additionally, the Arnault family and French oil company Total have each pledged 100 million Euros ($113 million), while more than 100 million Euros have been raised in donations from other individual and corporate donors in France and around the world. Companies like Air France, construction group Vinci and even Apple have pledged to donate to the rebuilding effort as well, according to CNBC. The French Heritage Society, an American non-profit group, launched a web page late Monday to help people donate, and as of publication, there were also more than 160 GoFundMe campaigns set up to raise money to help rebuild the monument. Though it will take time to come up with a repair plan, officials are taking steps to ensure that all funds raised will reach the proper channels. A spokesman for GoFundMe told Reuters that it will be "working with the authorities to find the best way of making sure funds get to the place where they will do the most good." Fund-raising efforts are sure to grow in the coming days, but here are a few ways you can donate funds that will go toward the imminent rebuilding right now. Friends of Notre-Dame: This international organization (a recognized public charity in the US) was the one primarily raising money for the restoration effort that was underway when the fire broke out. They have a dedicated webpage where you can easily donate. French Heritage Society: This US-based non-profit dedicated to the "preservation, restoration and promotion of the beautiful French heritage throughout the United States and France" has set up a special web page where you can donate funds to the repair and restoration effort for the medieval landmark. 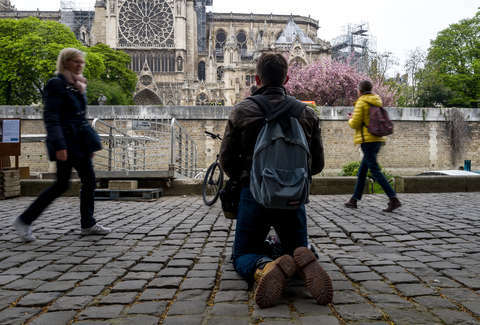 Foundation du Patrimimoine: This French non-profit which raises money for the preservation of cultural sites around France has set up a special page for Notre Dame donations, and has reportedly already raised nearly five million Euros. Though much attention has deservedly been paid to the effort to rebuild Notre Dame after the fire, it's worth noting that three different predominantly black churches in South Louisiana were recently targeted by an arsonist with allegedly racist motives. Those churches were nearly destroyed as well, and are each in dire need of help for repairs. If you're interested in donating there is a GoFundMe campaign page where you can do so.